Developing a lifestyle of health and fitness is certain to be a continuing positive influence as students grow and mature. At Raynor Country Day School, students are exposed to activities which encourage the development of basic motor skills and personal health. As students move through the school's physical education program, they are introduced to various "life sports." Life sports such as golf, tennis, bowling, and track are activities which children may pursue for the duration of their life, particularly into adulthood. Simultaneously, students are introduced to team sports in order to develop a sense of cooperation and teamwork. This area of the program is expanded with the implementation of Raynor Country Day School's traveling sports program. 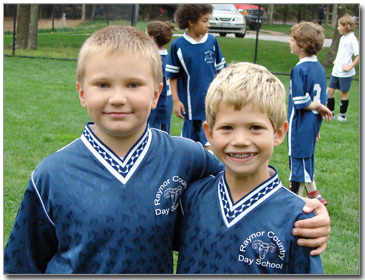 Raynor Country Day School proudly hosts three traveling athletic teams in the areas of soccer, basketball, and softball. The Raynor Rams, composed of fourth- -sixth-grade students, participate in a competitive schedule of games with many local private schools. Spirit weeks and homecoming events serve to promote a sense of school spirit and team pride. In addition, a cheerleading squad and mascot, Rocky the Ram, help to further celebrate the Raynor Rams' competitive spirit.